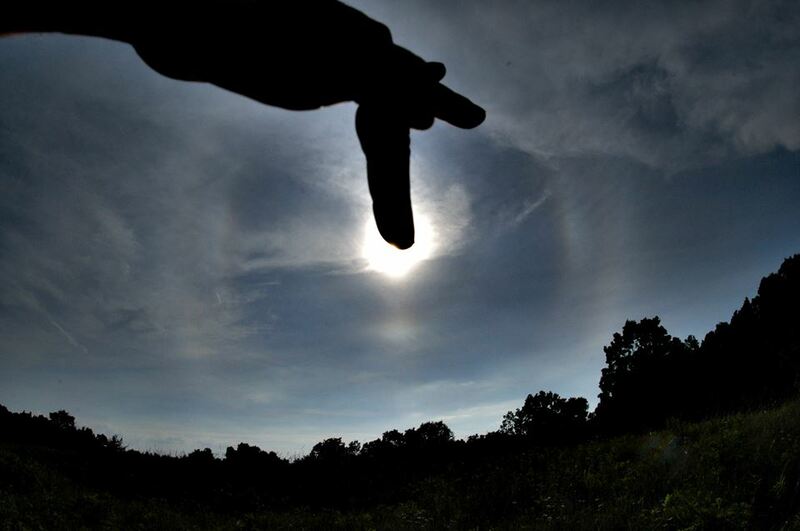 On June 17th, 2017 Michael Ellestad have recorded in Ohio, USA a nice pyramidal crystal halo complex. began in the morning and ended at midday and near evening the halos returned. In all he observed 9, 18, 23, 24deg and faint 35deg halos with upper and lower 9deg tangent plate arcs, 18deg lateral plate arcs, 23deg upper plate arc, upper and lower 24deg plate arcs and maybe the very rare pyramidal helic arc. The cause was the warm front of a small low pressure area over Lake Michigan. In such small depressions crystals often have only a short lifetime, but have optimal optical properties during this time. Since these small-scale low-pressure areas occur very frequently in the 5 Great Lakes of North America, this could be the reason why pyramidal crystals and haloes occur several times a year, more frequently than in most other parts of the world. But also the jetstream, which runs mstly over Ohio, could have a positive influence on the crystals, as was investigated by Rainer Schmidt in this article.